Email is a method of sending and receiving digital messages via the internet where the messages are usually encoded in ASCII text. The message is commonly referred to as a “mail” which is the most popular means of communication these days. It is a digital mechanism which promotes transmission of messages over communications network. Email has changed the way we send and receive messages. Gmail is the most popular and widely used email service offered by Google. Email has come a long way since it first entered the scene in the 1960s and got a better hold of the communication ecosystem by 1980s. From a text-based message exchanging service, Email has revolutionized the communication scene to become a worldwide phenomenon. Email is more than just text these days; messages can now be sent with multimedia content attachments including images and videos. Gmail is just one of many web-based Email services used to exchange digital messages over the internet. Email, short for “electronic mail”, is an electronic means of exchanging digital messages via the internet using electronic devices such as smartphone, laptop, tablet, desktop, etc. Initially, the messages were only text-based and they were encoded in ASCII text but technological advancement has extended the use of Email to carry not only text but also multimedia content including graphics, images, and videos. Email plays a great deal of role in the modern communication industry. What started merely as a means of electronic document transmission has now become a standard for exchanging electronic messages. The messages are referred to as mails which can be sent along with images and video attached with them. The message usually consists of two major sections – the header and the body. The message header, as the name suggests, provides a detailed log of the sender and the recipient along with the subject line and date. There can be one or many recipients depending on the type of message. The header usually marks the beginning of the mail which is essentially the destination (recipient) of the mail. The body of the message is the main part of the Email which contains the original message as a text along with other data as attachments. The current format for Email message is defined in the Request for Comments document “RFC 5322” which is specified in the Internet Message Format (IMF) – a standardized ASCII-based syntax for text messages exchanged between computers. Gmail is the most popular web-based email service developed by Google to send and receive email content via the internet. It’s a. POP (Post Office free service that allows users to send and receive electronic messages using electronic devices either using the web or via third party applications through POP or IMAP protocols Protocol) is the simpler and the oldest internet message exchange protocol that’s designed to support both local and offline email processing. Most email applications follow the POP protocol. The protocol simply allows users to download emails to their computer from the server, which are then deleted from the mail server once delivered. IMAP (Internet Message Access Protocol) is the most popular internet message protocol which allows users to check their email messages from several different devices. The idea of web-based email was first developed by the Google developer Paul Buchheit in the 1990s preceding the dispatch of Hotmail before Gmail was made available to the general public in 2004. It was initially designed for people already working at Google but eventually turned out to be revolutionary and a decade’s worth of hard work and continued evolution only adds to its momentous success. Over time, Gmail has become the dominant webmail service adopted by millions of users around the world. 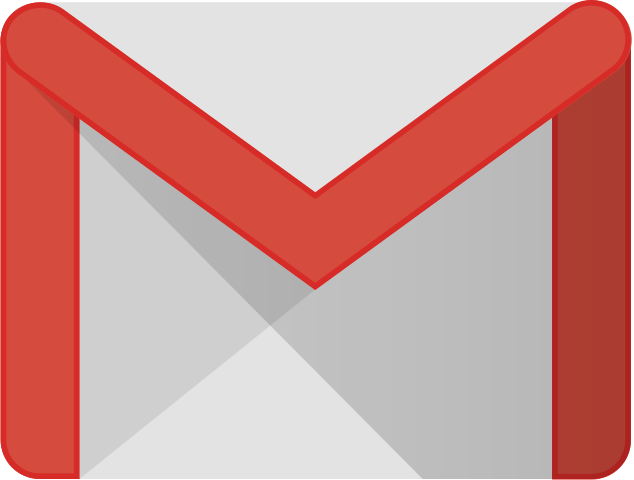 Besides its basic integration with the Google Account, Gmail is now a fully featured email service integrated with all the major services and products offered by Google such as Google+, Google Drive, Hangouts, YouTube, Google Calendar, and more. Email refers to the whole process of exchanging electronic messages over the web where the mails not only carry text but also many different multimedia content including images, graphics, and videos. Gmail is just an email service offered by Google and it’s one of the most popular email clients in the world followed by other services such as Yahoo mail, Outlook, Rediffmail, WebMail, and more. 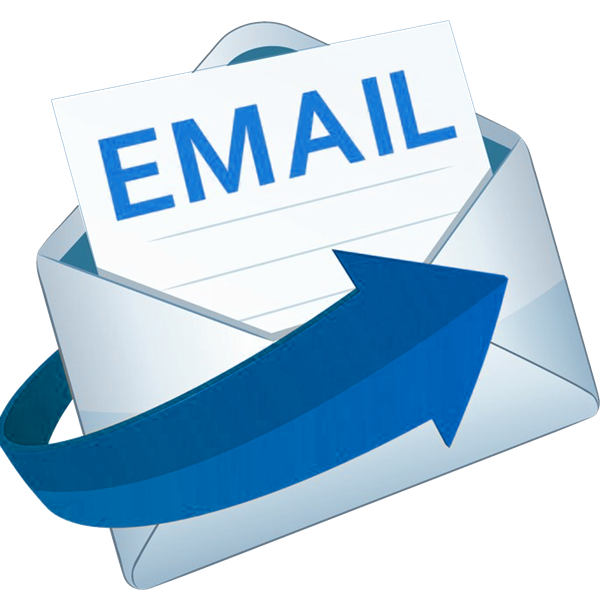 Email is short for electronic mail which refers to the digital messages exchanged over a communication network within electronic devices such as laptop, smartphone, etc. Email refers to the whole process to sending and receiving electronic messages via the internet, whereas Gmail is one of the many Email service providers or you can say Email clients. The current format for Email message is defined in the Request for Comments document “RFC 5322” which is specified in the Internet Message Format (IMF). Gmail is a free web-based service that allows users to send and receive electronic messages either using the web or via third party applications through POP or IMAP protocols. Email is just a general term to describe electronic mail; it’s just a means of digital message transmission over a communication network such as the internet. Gmail is the most popular Email client that is packed with additional features such as inbuilt virus protection, spam filtering, scheduling, Email reminder, Recurring Emails, and more. Email is a general term used to describe the whole process of sending and receiving electronic messages over a secured communication network called the internet, whereas Gmail is one of the many email clients owned by Google used to exchange digital messages either over the web or through third party applications using POP and IMAP protocols. Both may sound similar but they are distinct terms used differently. Email is nothing but a means of communication whereas Gmail is a platform through which Email can be sent or received. Sagar Khillar. 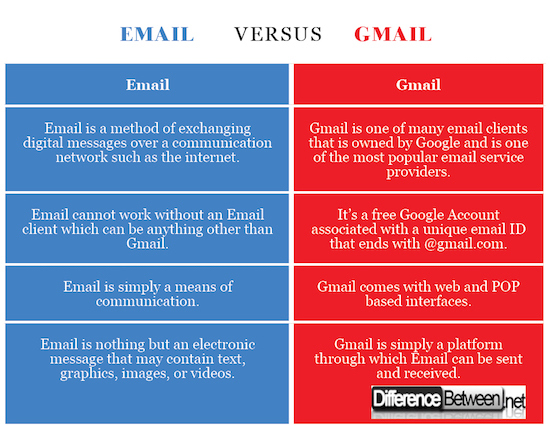 "Difference Between Email and Gmail." DifferenceBetween.net. May 31, 2018 < http://www.differencebetween.net/technology/difference-between-email-and-gmail/ >. Hi Mary like your comments. You wanted to my email. I have sent. This is a very useful page for ……..